Replacement specialist batteries for calculators, cameras, watches, pagers, organisers, car alarms, keyless entry and other electronic devices. Power for your Specialty Devices. The CR2016 lithium battery is ideal for watches, calculators, photography, memory backup and other electronic devices. Battery equivalent to: DL2016, CR2016, FA, BR2016, 208-202, 208-204, 208-206, BR2016-1W, CR2016-1W, KCR2016, L10, DL2016B, LM2016, SBT11, LF1/4V and ECR2016. The CR2025 lithium battery is ideal for watches, calculators, photography, memory backup and other electronic devices. Battery equivalent to: DL2025, CR2025, NA, BR2025, 208-205, BR2025-1W, CR2025-1W, KCR2025, L12, LM2025, SB-T14, LF1/2V and ECR2025. Extremely durable, it has found favour in compact devices that require the exact properties exhibited by the CR2032 cells – durability and longevity. Battery equivalent to: DL2032, CR2032, BR2032, KL2032, L2032, KCR2032, 5004LC, KECR2032, E-CR2032, SB-T15 and ECR2032. Blister pack of 2 batteries. The 186 (LR43) alkaline button cell battery is ideal for watches, calculators, photography, memory backup and other electronic devices. Battery equivalent to: 1176A, 186-1, 301A, GP86A, L1142, LR1142, RW84, V12GA, 186 and LR43. 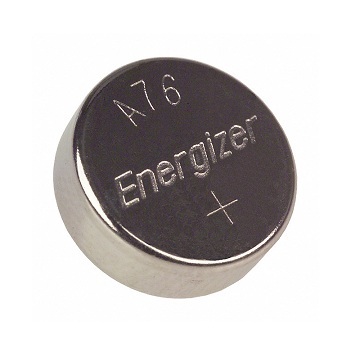 The A76 (LR44) alkaline button cell battery is ideal for watches, calculators, photography, memory backup and other electronic devices. Battery equivalent to: 1128MP, 1166A, AG13, D76A, G13A, GPA7, GPA76, LR1154, PX675A, PX76A, RPX675, S76, V13GA, 357A, RW82, KA, 208-904, SB-F9, G13-A, CA18, CA19, A76 and LR44. The 189 (LR54) alkaline button cell battery is ideal for watches, calculators, photography, memory backup and other electronic devices. Battery equivalent to: SR1130W, SR54, AG10, SB-BU, G10, 280-15, GP189, M, V389, D389, 626, S1131E, V10GA, LR55, GP389, LR1130, 389, 189 and LR54. The EL123 lithium cell battery is ideal for film and digital cameras and similar electronic devices. Blister pack of 1 battery. 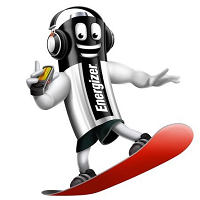 The A23 (MN21) alkaline cell battery is ideal for keyless vehicle entry systems, home securities, Bluetooth headsets, remote controls and other electronic devices. Battery equivalent to: 1181A, 8LR23, GP23A, 23AE, A23BP, DL21, DL23, MN-21B, V23GA and MN21. The 357 silver oxide battery is ideal for watches, calculators, photography, memory backup and other electronic devices. Battery equivalent to: SR44W, SR44, SR1154, SB-B9, 280-62, V357, D357, 228, S1145E, GP357, AG13, CA18 and 357. The 364 silver oxide battery is ideal for watches, calculators, photography, memory backup and other electronic devices. Battery equivalent to: SR621SW, SR60, SR621, SB-AG/DG, 280-34, T, V364, D364, 602, S621E, GP364, AG1, L621, LR621 and 364. The 371 silver oxide battery is ideal for watches, calculators, photography, memory backup and other electronic devices. Battery equivalent to: SR920SW, SR69, SR921, SB-AN, 280-31, T, V371, D371, 605, S921E, GP371, AG6, CX921 and 371. The 377 silver oxide battery is ideal for watches, calculators, photography, memory backup and other electronic devices. Battery equivalent to: SR626SW, SR66, SR626, SB-AW, 280-39, BA, V377, D377, 606, S626E, GP377, AG4, L626 and 377. The 386 silver oxide battery is ideal for watches, calculators, photography, memory backup and other electronic devices. Battery equivalent to: SR43W, SR43, SR1142, SB-B8, 280-41, H, V386, D386, 260, S1142E, GP386, AG12 and 362. The 392 silver oxide battery is ideal for watches, calculators, photography, memory backup and other electronic devices. Battery equivalent to: SR41W, SR41, SR736, SB-B1, 280-13, K, V392, D392, 247D, S763E, GP392, AG3, LR736, 192, L736, G3, V3GA and 392.